So there are nine days until Christmas and you haven’t gotten your shopping done? Don’t find yourself in line at the convenience store buying scratch offs at 5:00pm Christmas Eve. Here are some great ideas for readers that we offer here at Landmark Books which make it easy to make everyone happy. 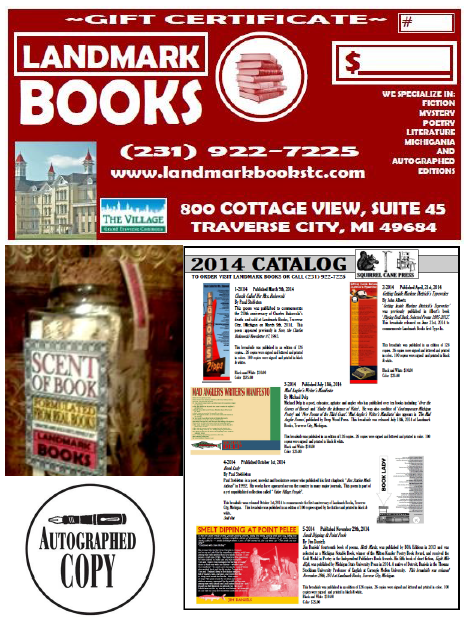 First, Landmark Books offers Gift Certificates in any amount for readers of any age. This is the perfect way to encourage reading and lets them pick out something they really want from our wide selection. Prices on our books range from $1.50 to $3,000 so we have something for everyone’s budget. Secondly, we carry Scent of Book. This is the perfect gift for the book lover in your life. Formulated from real books and bottled here in Traverse City. It will cure the reading blues and feed your imagination. But use it in moderation and keep it away from your Kindle. Thirdly, we offer a large selection of autographed and signed books by well known authors and prominent people in history. These books add that extra level of thoughtfulness for the reader in your life. Call or email if you have any questions and all our autographed copies are protected by our money back guarantee of authenticity. Lastly, Landmark Books carries limited edition broadsides and books. We carry a great selection from our friends at Deep Wood Press. These are fine letter press editions that are highly collectible and are a great gift. We also offer broadsides by Squirrel Cane Press which are limited editions and signed by the authors and are available for reasonable prices. So the clock is ticking but we will be open extended hours starting Friday for your shopping convenience.